Universal stepped shipping shoe with nailing fin slot cushion and protects standard window profiles during shipping and handling. Lightweight, extruded Polyethylene foam absorbs multiple impacts, energy, and movement to provide superior protection over other packaging methods. PROTEK™ shipping foam is reusable, recyclable, and water resistant, making it a preferred material over Styrofoam, cardboard, wood, and other sacrificial packaging. PROTEK shipping shoes are made with a universal shape to fit most standard profiles. Just slide them on. Shipping shoes are supplied loose in gaylords at 1600 pieces per box. Also available with a low tack adhesive strip on one side for added placement support. 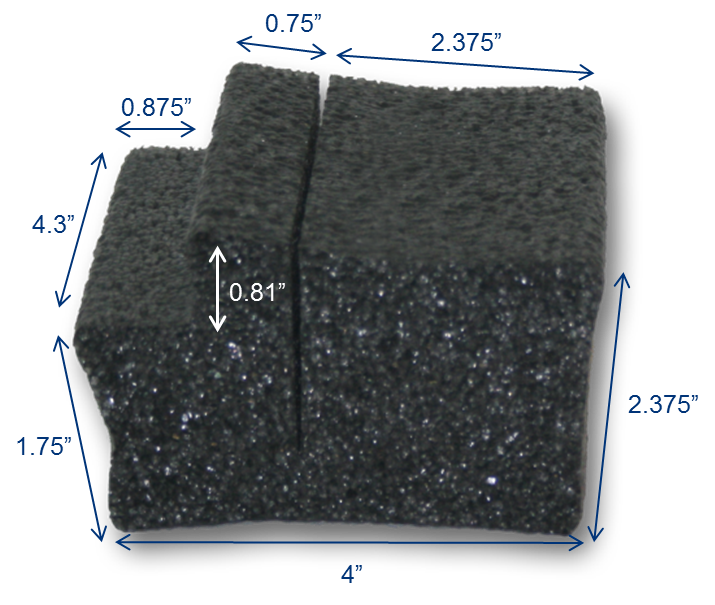 1.8# extruded polyethylene foam is charcoal in color. Award winning PROTEK™ foam profiles resist water, tearing and compression. This crush-proof foam is non-abrasive, reusable, and recyclable unlike other common packaging materials.